Huntsville, Ala., Dec. 17, 2012 /PRNewswire/ — Wolverine’s Microcool Division has launched its redesigned MicroCooling.com website and unveiled its new Online Store featuring commercially available MicroCool® Standard Cold Plates for the IGBT Power Electronic and CPU markets. The new site’s MicroCool® Online Store offers standard, semi-custom, and custom cold plate design options designed to fit most of the common IGBT and CPU configurations used today. 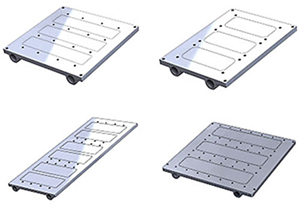 The Online Store platform is designed to give customers fast and easy access to a commercial stockpile of MicroCool® aluminum standard cold plates. Semi-custom and custom cold plates are built-to-order and are available for customers in need of a unique liquid cooling solution. MicroCool® will add new features to the site over time and plans to release its MicroCool® Tool in the first quarter of 2013. This new online tool is a cold plate simulator with a user-friendly interface designed to quickly provide thermal resistance, cold plate, and fluid temperatures, as well as pressure drop performance with just a few easy inputs.